After lunch, the more than 100 participants split up into training groups of half a dozen to develop skills for effective intervention in the “public consultation” meetings the Trudeau government proposes to hold over the coming three months. 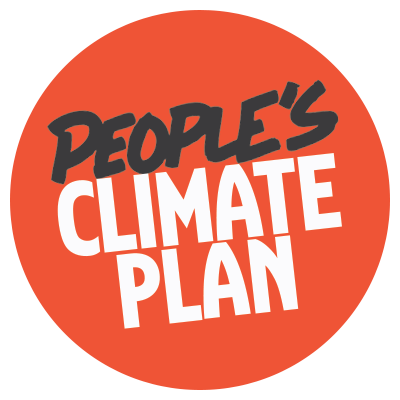 The proposed framework for this intervention is the People’s Climate Plan (PCP),2 a simple structure of three principles (or “pillars”) to guide those taking part in such gatherings. Science: keep fossil fuel reserves in the ground. Economics: a rapid transition to a clean energy economy. 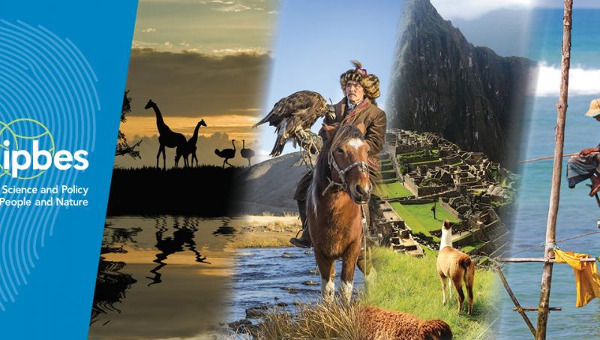 Justice: for Indigenous peoples, workers affected by the transition, and victims of climate change. A: Acknowledge the question posed by the organizers. B: Bridge over to the question you wish to address, which should be aligned with one of the three PCP principles. C: Provide Context to sustain your view, preferably with a personal anecdote or insight that illustrates why you care so much about the issue. 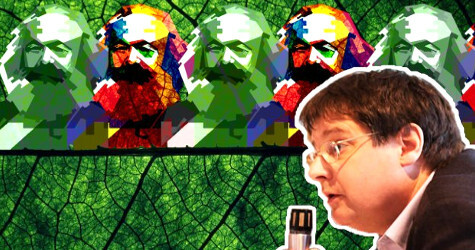 Achieving this degree of focus may seem a tall order for environmental and social activists. Often we use discussion periods to express a broad and seemingly chaotic range of personal viewpoints. We rightly prize our diversity. Yet when entering a discussion structured by a government with quite alien goals, PCP activists suggested, we must harmonize and unify our approaches. I myself participated in such an effort in February, when I attended an East-End constituency Liberal policy conference along with three other supporters of Toronto East End Against Line 9. After smoothing the way with kind words about positive aspects of Trudeau’s promises, we were able to win the conference to our key points on climate policy, while making new friends for our committee – much to the consternation of the local Liberal MP. From left: Myeengun Henry, Gabriel Allahdua, Megan Whitfield, Adam Scott, Avi Lewis. Photo by Kevin Taghabon. In the June 4 conference, a couple of hours of intense work in our breakout groups familiarized us with the PCP approach. 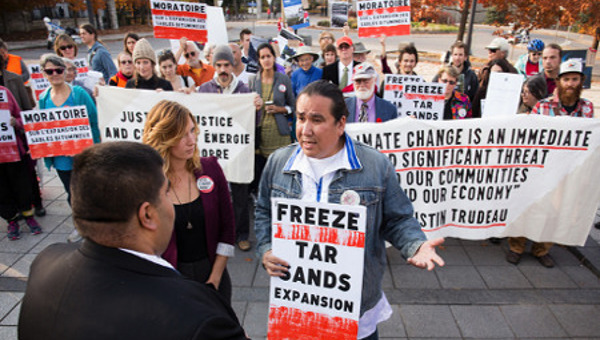 The keynote speaker, Myeengun Henry of the Chippewas of the Thames First Nation, recounted how his people, who live in southwest Ontario, learned that a tar sands pipeline, Enbridge’s “Line 9,” was to be built across their traditional territory, without the consultation required by Canada’s constitution. Alarmed by the danger of a poisonous tar sands oil spill in their territory, the Chippewas asked the federal government for consultation. There was no response. So Myeengun’s people boldly challenged the federal regulator’s right to approve the pipeline and took their case to federal court. The Supreme Court has agreed to hear their case, which will be argued on November 30. But the Chippewas of the Thames are aiming at more than stopping a pipeline. They have visited New Orleans to express support for hundreds of indigenous families there who have been driven from their homes by the effects of climate change. The Chippewas plan to bring together Indigenous climate protesters from B.C., Nunavut, Atlantic Canada, and the U.S. – “from all of Turtle Island” – on Chippewas of the Thames territory at the end of August. Participants donated $2,100 to help cover the legal costs of the Chippewas’ Supreme Court appeal. “St. Lucia and other poor countries are the least responsible for climate change but suffer its worst effects,” Gabriel said. The island is impoverished, battered by the global economic conditions, and its banana-based economy is vulnerable to “devastation by hurricanes that get worse and worse.” Meanwhile, extreme weather events, driven by climate change, extract an increasing toll, with 90 per cent of deaths occurring in “developing” – that is, poor – countries. Gabriel’s group, Justice for Migrant Workers, demands that migrant workers in Canada receive status, in order to provide equal rights to all workers. Megan Whitfield, Toronto President of the Canadian Union of Postal Workers (CUPW), spoke on the theme of community power. “We have to get our own members engaged in efforts regarding climate change,” by remaking Canada’s publicly owned postal service into a community-based network to reduce carbon emissions, she said. Megan urged environmentalists to support the campaign to Save Canada Post and to take part in the present governmental postal service review. Yet the Trudeau government insists that we can further expand oil consumption and usage while reducing emissions – an absolute impossibility. “We must ask Ottawa: if you increase oil industry emissions, what do you intend to cut out to make up for that,” Adam said. The world’s fourth-largest oil company, France-based Total S.A., has conceded that part of the world’s fossil fuel reserves must be left in the ground. A secret report by Policy Horizons Canada has told the federal government that the fossil fuel industry must close down very quickly, as renewable electricity becomes the main source of energy supply. Oil pipelines are at high risk of becoming economically unviable, the report says. The Canadian Centre for Policy Alternatives has flatly denied that Canada can build pipelines while keeping its climate commitments. 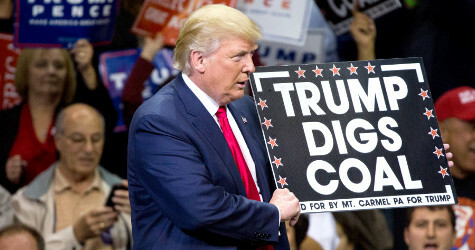 Trade deals that give corporations a right to sue over climate action measures. Privatization moves such as Hydro One in Ontario. Structural racism such as that imposed on migrant workers. This article was published at johnriddell.wordpress.com. 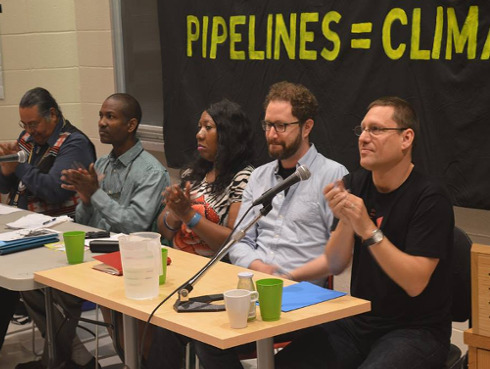 The June 4 event was organized by an ad-hoc working group including 350Toronto, Toronto No Line 9 Network, and Climate Fast. It was hosted by Rising Tide Toronto, an Action Group of OPIRG TORONTO. The People’s Climate Plan is organized and sponsored by a broad spectrum of groups including 350.org, Canadian Youth Climate Coalition, Council of Canadians, East End Against Line 9, Idle No More, KAIROS, Leadnow, Leap Manifesto, Stand (formerly ForestEthics), and United Church of Canada.